The venerable “Paperless Office” has been a perennial buzz-term ever since computers revolutionized our offices. 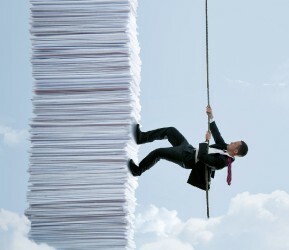 However, for many, going paperless is still seen as just a lofty goal, or a techie’s naive dream. The funny thing is, you’ve been increasingly going paperless without even noticing it. Just take a moment to look at your email inbox, and imagine how much paper all that communication would have generated in the past. Without much thought, the entire world has shifted quite painlessly from the triplicate-copied, mimeographed office memo to the convenience of digital messaging. The key then to going paperless is to make the process seamless and easy, so you don’t have to spend more time learning how to do things a new way. While the environmental benefits of a paperless office are obvious, it’s the tangible economic savings that make it a no-brainer. Paper and toner cost money, but so does wear and tear on office equipment. Reducing the amount of paper and file folders needed to store documents can increase the longevity of printers, photocopiers and fax machines by reducing their usage. But the cost savings don’t end there. Physical files take up valuable room, so storing them electronically frees up space, cuts clutter, and adds up to real savings in rent. Then there’s the human cost. Hunting for documents and files wastes precious time, and as every smart manager knows, time equals money. Electronic storage enables workers to find materials faster as well as transmit them expeditiously without having to use a photocopier, envelopes and postage. Lastly, there’s the added benefit of security. Confidential data that can only be accessed via a password is safer than paper files that can get misplaced, stolen or viewed by unauthorized parties. Plus, storing documents online ensures that crucial information won’t be destroyed in the event of fires, floods or other disasters. Going paperless is one of the design philosophies that drives development at EMPOWER. Using some of the tools that are available through the system, you and your office can reap the rewards of reducing your reliance on paper. The most obvious of these features is EMPOWER’s online document system. Throughout the site, users can easily upload any file and attach it, for example, to a violation or work order. On EMPOWER’s end, the files are compressed, encrypted and stored in a secure database, where they can then be accessed at anytime, from any place. Some EMPOWER customers have already made the commitment to go paperless when handling their violations, and have become aggressive uploaders, confident that their data is safe and secure. One great feature to keep in mind is EMPOWER’s “upload once, attach everywhere” ability. Once a file has been uploaded once, it can easily be attached to a different complaint or request at a later date, eliminating the need to upload the same documents again and again. recognized, archived and attached to the appropriate violation or repair within EMPOWER. The process is painless, and the savings in time and money are real. As mentioned before, we’ve already gone paperless in our day to day communications. With the prevalence of smart phones, accessing and responding to email has become part of daily business life. With EMPOWER’s rich notes feature, you can extend that level of connectivity in ways that were much more cumbersome before. Whenever anyone adds a note in EMPOWER, the members of their team associated with that building immediately receive an email notification with the contents of the note. By simply replying to that email, users can create a follwup note, and start a conversation. And, like everything else in EMPOWER, the notes are saved forever, where they can be accessed from anywhere at anytime. The City of New York also sees the value in paperless transactions and they recently launched a new online e-Certification process to handle HPD violations. Unfortunately, they failed to recognize the importance of making any paperless system seamless and stress-free. While their intentions are laudable, the execution may actually be more bother than it’s worth. (We actually met with the HPD team that developed the system, where we discussed simplifying the process and working together in the future.) The system allows owners and managers to register, one, and only one, person to certify violations for a particular building online. Once registration is complete (a process that can actually take a few days), violations can be certified by logging in, filling out some info online and waiting for the system to call a phone number you specified during registration, with a unique confirmation code that you then enter online. The phone verification happens every time you certify a violation, making it difficult to delegate the responsibility of certifying violations to anyone else. Any changes to the registered user, such as a different confirmation phone number, requires another signed and notarized form, along with the requisite few days of processing. By merely harnessing some of these tools, you can transform your management business and increase your bottom line. Dave Gross is President and Chief Technology Officer at EMPOWER NY.